More than 1,000 people made reservations through a secret hotline and attended the pop-up location for free food and drinks. Taco Bell created a "council" to represent traditional fried chicken establishments on social, forcing the launch of its Naked Chicken Chalupa underground to a Manhattan speakeasy. More than 1,000 fans made reservations through a secret hotline and attended the pop-up location for free food and drinks. Taco Bell, aided by PR AOR Edelman, began planning for the launch of the Naked Chicken Chalupa in late fall 2016. Part of the campaign strategy was to create a brand voice which would seemingly be at odds with the release of the Naked Chicken Chalupa. The goal was to create a buzz which would add to the allure of the new product, while also taking a subtle shot at traditional fried chicken establishments. Thus, the idea for "The Council For Eating Fried Chicken The Same Way You Always Have" was born. "We knew that this product was great and innovative, almost too innovative to the point where people might hear the idea of the fried chicken taco as kind of crazy," said Matt Prince, PR and brand engagement manager at Taco Bell. "With this campaign, we wanted to balance fears." The campaign team wanted to create a unique activation in response to the council’s messaging, which had driven the Naked Chicken Chalupa underground. A pop-up "speakeasy" became the idea to suit this progression, as well as serve as the launch for the product itself. In terms of social efforts, the PR team wanted to incorporate both the council and Taco Bell's branded channels in a way that would drive engagement with fans leading up to and following the product launch, and also help highlight the upcoming speakeasy activation. A microsite for both the product and the council were developed. On January 11, campaign efforts began with branded social channels created to represent "The Council For Eating Fried Chicken The Same Way You Always Have," posting teasers for the upcoming release of the Naked Chicken Chalupa and encouraging fans not to be "seduced." Prior to the product launch, the campaign team began a five-day tour of several cities across the country to give media and food bloggers a chance to taste and experience the Naked Chicken Chalupa. The tour of embargoed private tastings, which began at Taco Bell’s headquarters in Irvine, California, included stops at the chain’s locations in Austin, Texas and Chicago, Illinois. Some outlets in attendance included: Business Insider, Foodbeast, GQ, Delish, Food and Wine, USA Today, Refinery 29, People magazine and Teen Vogue. "Our goal was really to get food into the hands of the people with the loudest voices," added Prince. Two days prior to the launch, the campaign team arrived in New York and played host to media outlets for private showings of the speakeasy space. In addition, social influencer Gabbie Hanna was invited the pop-up prior to launch to produce content for social. Deutsch was tapped to assist with digital and advertising efforts to push the campaign through paid messaging on social and traditional channels. The Taco Bell Speakeasy launched to the public in a pop-up shop near New York University in Manhattan on January 24, two days prior to the Naked Chicken Chalupa being made available at Taco Bell locations. Octagon assisted with the planning and coordination of efforts involving the speakeasy. 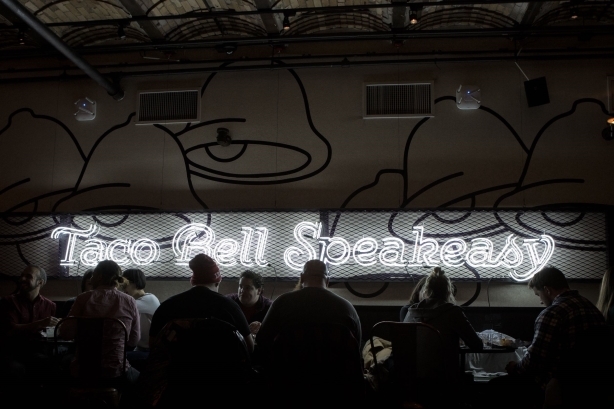 Through social posts on branded channels and a microsite on the Taco Bell website, fans were given the opportunity to call a hotline to set up reservations to attend the speakeasy. Up to 500 people per night were allowed in and treated to free Naked Chicken Chalupas and cocktails during the two nights of the activation. Through branded social channels, Taco Bell and the council continued to push content about the new item until early March, when the product was no longer available. Campaign efforts have generated more than 3 billion media impressions, measured across both traditional and social outlets. In total, there were over 1,500 broadcast clips and articles covering the Naked Chicken Chalupa launch campaign. Several notable outlets covered the campaign, including Delish, USA Today, Business Insider, Time Out New York, Supercall, GQ, Fast Food, and Food and Wine, to name a few. The two-day Taco Bell Speakeasy activation reached maximum capacity with over 1,000 reservations.